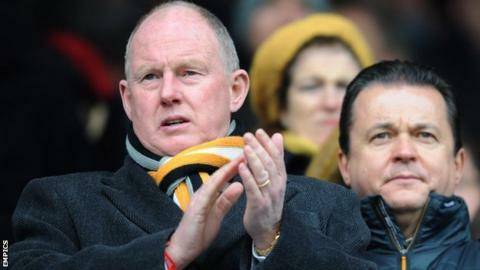 Wolves owner Steve Morgan has offered to leave the relegation-threatened Championship club. Wolves are two points from safety following a turbulent 12 months which has seen the club suffer relegation from the Premier League and have four different managers. Following widespread criticism, Morgan told Wednesday's Fans' Parliament: "If you want me to go, I'll go. But, like the fans, he insists that is driven only by success for Wolves. "About 10 years ago I came very close to buying Liverpool as everyone knows. When it didn't happen I was disillusioned with Liverpool at the time and never felt the same about it again. "I got approached by 14 different clubs asking if I would go and invest in them. It was the same answer to all 14. Not interested. "I then came to Wolves one day with my friend Delia Smith when they were playing Norwich City. And I got nobbled by Jez Moxey. "As a kid the team I looked up to was Wolves - that was the second result I looked for after Liverpool. I felt there was something special here. I decided it was something I would like to do." "If they want to drive me out of the club I will go," said Morgan. "If it gets to the point where I feel I am not wanted I will go, simple as that. "But, if that day comes, it won't be for the want of trying or effort." Morgan, the multi-millionaire owner of North-West house building firm Redrow, said that he is even willing to talk to potential new investors - alluding to an approach a couple of years ago that subsequently "disappeared in a puff of smoke" when asked for proof of funding. But the boyhood Liverpool fan, whose first attempt to buy a football club ended in failure at Anfield eight seasons ago, insists that he has no regrets about switching his attentions to Molineux in August 2007. "The last 18 months have been crap," he told the selected gathering of Wolves supporters at Molineux. "But do I regret coming here? No. Is the job too much for me? No. What's my exit plan? I don't have one. "I am fully committed to this football club and I want exactly the same as you [the fans] want. "I am not here for any other reason than to try and make the club successful. "I am pouring money in and we are losing £6.5m this year and you don't want to see the budget for next year. We have players on big salaries and we are going to lose an absolute fortune." The club have been criticised this season for spending money on their expensive reconstruction of Molineux's new North Bank stand, rather than strengthening the team who are now in the bottom three and without a win in 12 matches - the last eight of them under new manager Dean Saunders. Although seven new signings were brought in by previous manager Stale Solbakken in the summer, only one of them, Bakary Sako, has been deemed a success. "Jez Moxey gives 100% all the time. Fans genuinely applaud effort and, if they knew the effort Jez puts in, they would be applauding him and not giving him stick. "In terms of professionalism I meet all the chief execs in this league and the Premier League and this guy is the best. Nobody understands the game and the processes like Jez does. He is the toughest guy on the planet in terms of buying and selling players. "People love to hate him but let me tell you - he is one of the most respected guys in football. And I hear that from everyone in football. They tell me I have got a great guy in Jez Moxey. I don't know where we'd be without him but I don't want to be in a position to see it." And, despite sacking Solbakken early last month and appointing Saunders, Wolves failed to make a senior signing in the January window. But, in an impassioned appearance at the latest of the club's regular Fans Parliament sessions, Morgan revealed that, since ending Sir Jack Hayward's 17-year reign at Molineux by completing his takeover of Wolves in August 2007, he has spent £73m on player purchases. And, having banked big money following the summer sale of star players Steven Fletcher, Matt Jarvis and Michael Kightly, who all preferred to stay in the Premier League, Morgan defended the construction of their new stand. "The stand is the infrastructure for the club for the future," he added. "People say why did we buy the stand and spend £18m? "But I could find a lot more than £18m in transfers that have been a waste of money." Having also revealed that Wolves chief executive Jez Moxey took a 50% pay cut following relegation, Morgan is now calling for a united front following speculation that fans are planning a protest at Friday night's home game with promotion-chasing Watford. "We are all in this together," said Morgan. "Do I want to see a protest out here on Friday night? No. "Anyone connected with the club knows our position is unacceptable. But protesting against the players undermines everything. Turning on our own is not the way to do it."